When we first moved to North Carolina, we found out about free concerts on the water. Every Friday in the summer, the town sets up a huge stage on the riverwalk and hosts a local band who opens for a nationally-touring cover band. One block of the riverwalk is closed for those hours and you're able to buy beer and wine and drink it on the courthouse steps. The first summer we lived here, the same food truck would come each week, serving the same North Carolina BBQ, and we made it our Friday night dinner. It became our thing, our very North Carolina thing. So when we got engaged, we really wanted to have that food truck come and cater our rehearsal dinner. We wanted to share that part of our North Carolina lives with our friends and family. We were thinking food truck, beer from the local brewery, and dessert from the local frozen yogurt place. But then, a few months into planning, we fell in love with a caterer. He was from Pete's town in New York and moved to North Carolina. He was able to cook North Carolina BBQ, knew what our New York family and friends would be expecting, and could take care of the beer and wine. It made our lives a lot easier. We did, however, get dessert from the local frozen yogurt place. We got to pick 18 different toppings, plus four syrups, and the company brought enough yogurt and cups for 100 people (yes, we had a large rehearsal dinner. We invited all of our wedding guests). What was fun was that the frozen yogurt place actually brought a portable frozen yogurt machine (you know, with a handle, just like in the shop) so our guests actually got to serve themselves as much or as little as they wanted. It was such a hit because it was something completely different. I had never seen it at a wedding before (or after) and was a great talking point of our rehearsal dinner. Plus, it was a fun way to bring a local business that we love to our guests, especially since they might not have had time to explore our city to check it out for themselves. And, part of our pre-engagement scavenger hunt (that's how Pete proposed) took place at this frozen yogurt shop. So it was a nice way for us to incorporate our engagement into our wedding. Plus, who doesn't like the novelty of frozen yogurt? And people will love if you have a food truck at your wedding. You could have the food truck cater your entire affair or just be available for a late night snack for your guests as they're leaving your wedding. After a night of drinking and dancing, everyone would love to stop at a taco truck. It would be a great hit (and better than a few other favor options). Be sure to ask your food truck if it will provide to go containers if you're going with a late night snack idea or see if you have to bring your own. And, to make it even more personalized, you can ask the food truck operators to stick personalized wedding stickers (that say thank you) on the to go boxes. Call your favorite food truck and see if they do catering. Some will offer a catering service and others will roll up and cater out of the truck (the latter is what you want). 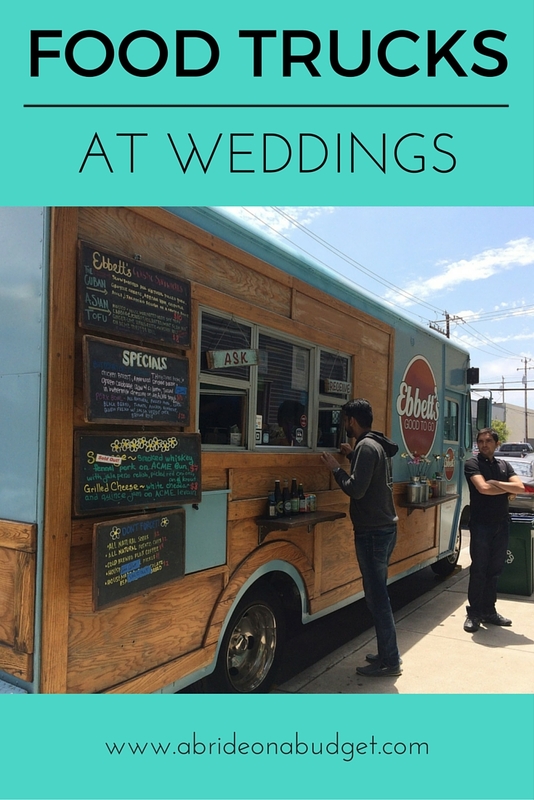 If you do want a food truck to cater your wedding, be sure to ask your venue if the food truck is able to park outside. Some venues won't allow this and you'll want to know that before booking. If your wedding is at an outdoor venue, make sure there is somewhere the food truck can park. Many places may take issue with tire tracks left behind. 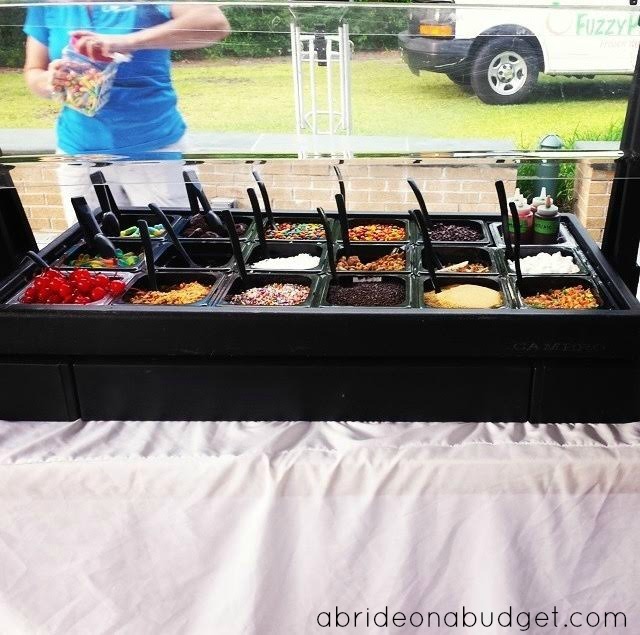 BRIDAL BABBLE: Have you seen food trucks at weddings?